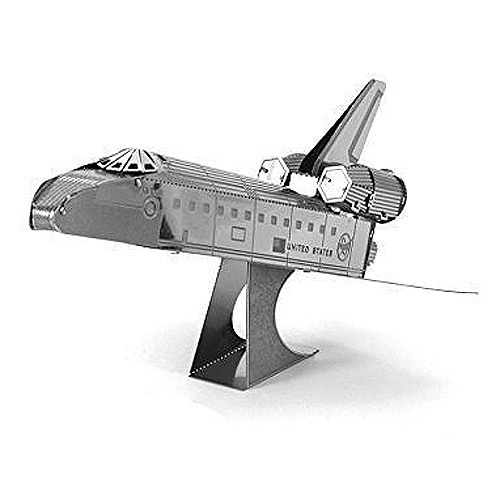 Assemble your own Space Shuttle with ease with the NASA Space Shuttle Enterprise Metal Earth Model Kit. Use the easy-to-follow instructions included with the sheet to pop out the pieces, bend the tabs, and connect them at the attachment points! When assembled measures about 3 9/10-inches wide x 2 7/10-inches long x 1 9/10-inches tall. The First Space Shuttle built was the Enterprise. It was built by Rockwell International to be used by NASA for test flights in the atmosphere. The Enterprise had been designed so it could be refitted and used for orbital flight. However, this plan proved too expensive and so it was decided to simply build a new shuttle called Challenger. The Enterprise now resides in the Intrepid Museum in New York City. Ages 14 and up.